At first open Visual Basic 6.0 application software. Then click on or select ‘Standard EXE’ icon from New Project dialogue box. Select ‘Form1’from Form Window and select ‘Caption’ from Properties Window. Then replace ‘Form1’ to ‘ODD or EVEN Project’ from properties window. Then select ‘Label1 box’ from Form Window and select ‘Caption’ from Properties Window. 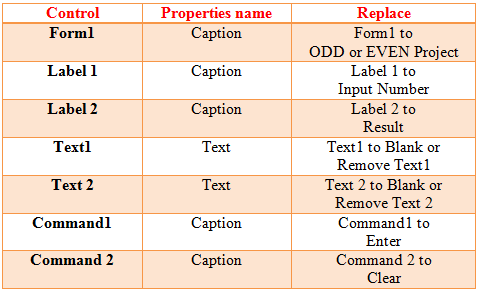 Then replace ‘Label1’ to ‘Input Number’ from Properties Window. Then select ‘Label 2 box’ from Form Window and select ‘Caption’ from Properties Window. Then replace ‘Label 2’ to ‘Result’ from Properties Window. Then select ‘Text1 box’ from Form Window and select ‘Text’ from Properties Window. Then remove or erase ‘Text1’ from Properties Window. Then select ‘Text 2 box’ from Form Window and select ‘Text’ from Properties Window. Then remove or erase ‘Text 2’ from Properties Window. Then select ‘Command1 box’ from Form Window and select ‘Caption’ from Properties Window. 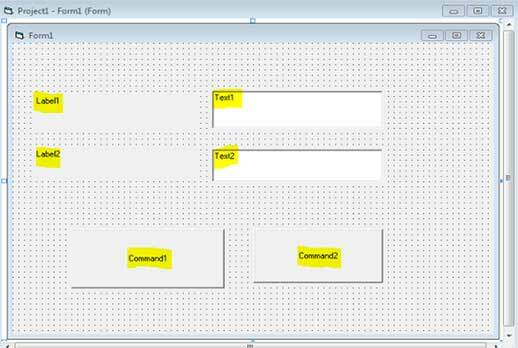 Then replace ‘Command1’ to ‘Enter’ from Properties Window. Then select ‘Command 2 box’ from Form Window and select ‘Caption’ from Properties Window. Note: - ‘Dim’ is a variable. When we are through something then we write ‘Dim’. Here we get variable ‘A’. ‘Mod’ = Remainder value. Example: - 24/2 = 12 and remainder value is 0. Then click on ‘Enter’ button. Then click on ‘Clear button’ for clear the Text Box.